Simplify the complex with this 4-color 36″ x 24″ visual representation of nature’s elements. Each element square contains full name, chemical symbol, atomic weight, atomic number, & number of electrons in each of its shells. Color-coded. History & class description is given along with a graphic representation of the elements that make up the atmosphere, earth’s crust, and oceans. Simplify the complex with this 4-color 36″ x 24″ visual representation of nature’s elements. 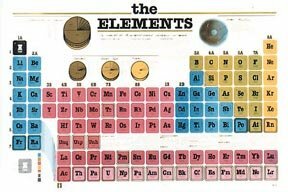 Each element square contains full name, chemical symbol, atomic weight, atomic number, & number of electrons in each of its shells. History & class description is given along with a graphic representation of the elements that make up the atmosphere, earth’s crust, and oceans.